Needle Felted King Bird... it's New Year's Eve! This is my second needle felted bird post in a row, and it won't be the last! I made a few batches of birdies for Christmas and thank you gifts. This one is special because he has a little crown on. I made him for my crafty buddy Audrey. Check out that colorful spotted tail :) My brother and his wife must be psychic, because they sent me another couple of packs of dyed/plain guinea fowl feathers for Christmas. I have been using them like crazy. Did you know it's way easier to needle felt a big beak than a little one? True story, unless there is some awesome tiny-beak method that I have yet to figure out. I looked out the window, and what did I see? This crazy bird hopping 'round my apricot tree! Well, it wasn't an apricot tree, and the bird wasn't hopping around, but that would have been fun. I made this little needle felted bird of paradise for myself on Sunday because I needed to make something for me to keep :) It's a gorgeous morning today in Alabama, so I decided to go outside and take some pics of my new birdy. Photogenic little chap, isn't he? He'll soon be roosting on my totally ornament-encrusted tree. I'll have to find a good spot for him. The long pretty tail feathers are from an emu. I've been hiding them away for a long time (picked them up at the critter zoo a while back), and finally found them when I did a little organizing. It sure feels good to finally use some random supply you've been hoarding forever, doesn't it? Here is the final little penguin craft, maybe until next year. It's a little magnet! The penguin is a little watercolor illustration I did just for this magnet, and the background is collage. That's it for today, I've got more to share once Christmas gifts are delivered :) And let me just say that I love that it's the weekend! Who's with me? I promised more penguin stuff, didn't I? :) Here is a mixed media art quilt that I made from all sorts of scraps of fabric of different kinds. It always feels good to use up scraps, but my scrap bin level seems to NEVER go down... Someday, I've gotta make something huge from my scraps. For the lettering, I used acrylic paint to write "Let it snow" and then used my sewing machine to stitch over the letters once the paint had dried all the way. I thought the effect was pretty cute, and I'll have to do it again. 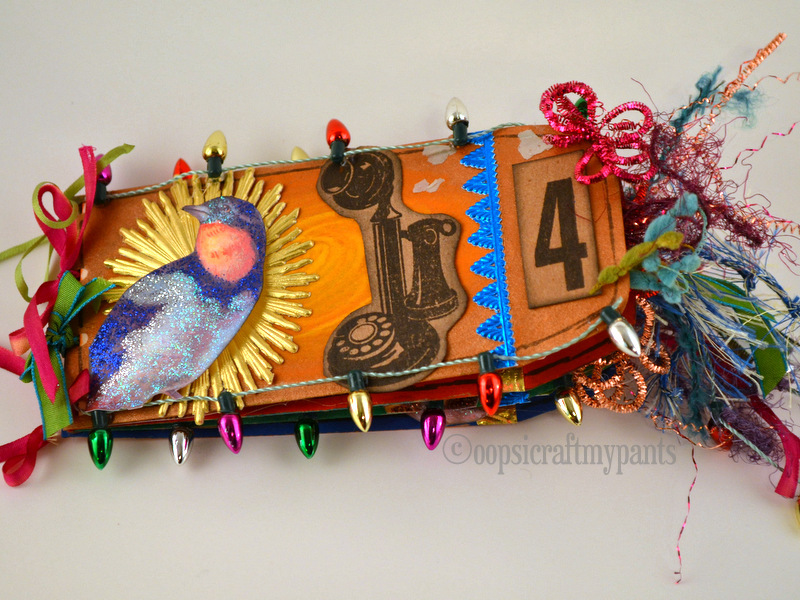 I'm wanting to make a toucan art quilt wall hanging with a nice encouraging quote on it. I think I might have time once the holiday rush has died down. There's a spot above my fireplace that has just been begging for a big ol' piece of art. Anyway, I hope you all are having a fun December so far... I'm finding myself wishing for a little more cold weather. Today was super muggy, a little rainy and almost 80 degrees out. It doesn't feel like Christmas! Heck, I didn't even need to wear socks today, and socks are one of my favorite things about winter :) That and sweets. My goodness gracious. I have been SO busy, and I get to count this blog post right here as a break, then I'm back to work. I am sharing this wee needle felted penguin wearing a colorful winter sweater. I was in another Craftster Swap (I'm swearing off of these for a few months, I need a break) and one of my partner's holiday themes was "Penguins in Colorful Clothing." If you know me, you can guess why I'd want to pick THAT theme. So for one of the items (more penguin items to come soon), I needle felted this penguin using beautiful wool sent to me by the lovely Belladune of SpinHeartSpin. His little jacket-vest is cut from a felted sweater I picked up at a thrift store fill-a-bag sale. I love those. And the clothing...is...optional... Tee hee. This is what penguin looks like au natural, sweater removed. Meep meep meep (this is the sound that I imagine penguins make). He says "Merry Christmas." and several digital imaginary hugs to everyone who has taken time to leave me a kind comment or word of love or encouragement. It seems like tons of very happy or very sad or very busy things have come at me all at once lately, and I've been hanging on for dear life, getting by day by day. I haven't found the time to comment back to each of you, but please know that I have much much much love and appreciation for you guys. Sparkle, sparkle! I made this envelope book... do you get the reference? 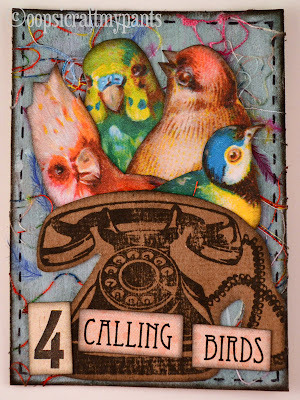 4 Calling Birds, birds and phones. I love Christmas, and I am so glad. I love having my Christmas tree up, and even though it's completely encrusted in ornaments and other glittery nonsense, I thought it could use another little book among its branches. 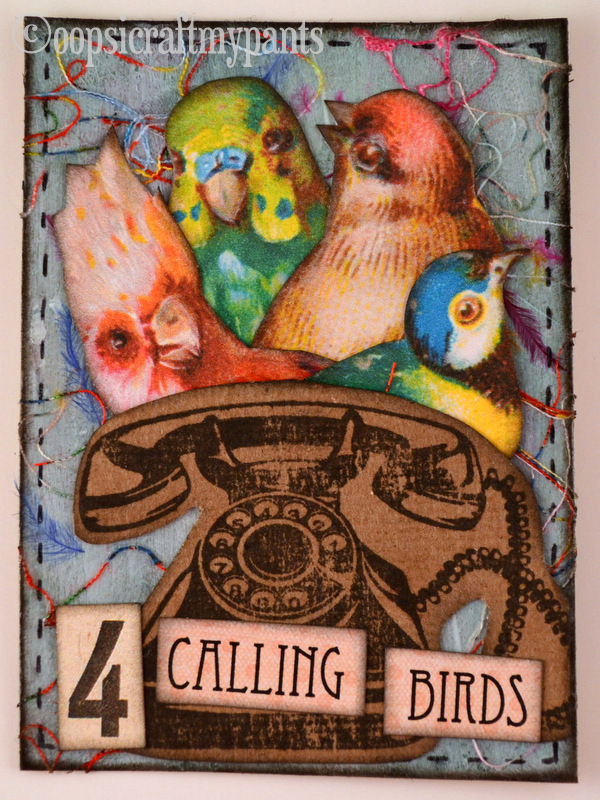 And hey, guess who the 4 calling birds are calling? Santa. 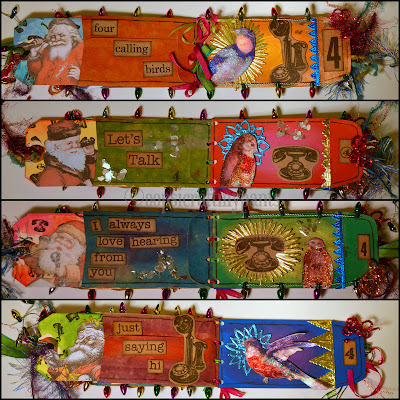 Each of the pages (which are envelopes) have a tag that pulls out to reveal Santa on the other line. I used the Santa on the Telephone Collage Sheet for those. The birds are from the Robin Red Breast Collage Sheet. I added a little glitter glue for extra sparklies. 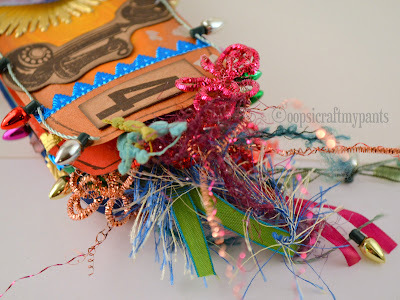 I used all sorts of different ribbons and fibers and embellishments from Alpha Stamps. 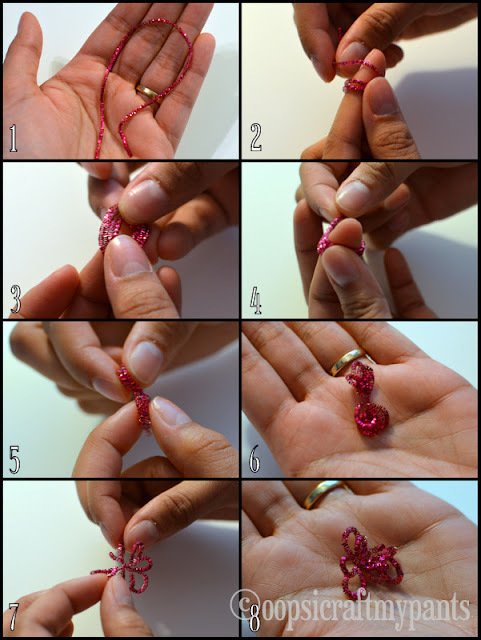 My favorite are the little sparkly flowers I made using metallic crinkle wire in pink, copper and red. To make those little flowers, you take a piece of crinkle wire about 8 inches long and wrap it around your finger. Take the wrapped circle and then twist the center twice so you have a sort of bunch. Then you delicately separate and arrange the loops, and voila! A sparkly little flower ready to glue onto whatever needs some shine. It's December! That means a new challenge over at the Unique Crafters Challenge Blog. This month is sponsored by Cedar Chest Designs. For this month's Christmas challenge, I made this Santa Claus card, wishing you a very merry Christmas. Ho ho ho, jinglebells, pointsettias, holly and whatnot.